Case International Harvester Parts. Three (3) row, eight (8) fins per inch. 580K INDUST/CONST; 580SK INDUST/CONST. Our ordering system is automated. MyTractor carries a full line of tractor parts, accessories , decals , emblems and I&T Shop Service Manuals for most makes and models of tractors. We stock parts for the following brands: Allis Chalmers, John Deere, CaseIH, Kubota, David Brown, Mahindra, Deutz-Fahr, Massey Ferguson, Farmall, Minneapolis-Moline, Fendt, New Holland, Fiat, Oliver, Ford, White, International Harvester , Yanmar, J. Case, Zetor and more! MyTractorParts is a major North American Distributor for Aftermarket Tractor Parts including Filters, Engine part, engine kits, front end parts, tie rods, cylinders, pins, seal kits, rims, wheel hubs, axle parts, bearings, transmission gears/shafts, operator station parts, seats, PTO, hydraulic / steering / water pumps, radiators, oil coolers, hay balers parts. Plough tools, rake teeth, alternators, starter and more!! MyTractor is an aftermarket supplier for John Deere®, Perkins®, Caterpillar®, Yanmar®, Cummins®, Kubota®, Mitsubishi®, Shibaura® and International Harvester®/Navistar®. All rights are reserved by these companies. MyTractor is NOT an OEM supplier and does not represent these companies. All names, trademarks and part numbers are used for descriptive and identification purposes only. 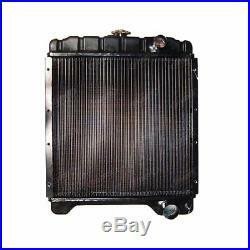 The item “1706-6507 Case International Harvester Parts Radiator 580K INDUST/CONST 580SK I” is in sale since Wednesday, June 8, 2016. This item is in the category “Business & Industrial\Heavy Equipment, Parts & Attachments\Heavy Equipment Parts & Accessories\Tractor Parts”. The seller is “mytractorparts” and is located in Canada, USA. This item can be shipped worldwide.